In medium bowl, stir all ingredients except whipped topping until blended. Pour 1/4 cup of mixture into each muffin cup. Bake about 30 minutes or until muffin tops are golden brown and edges are starting to pull away from sides of pan. Cool 10 minutes. With thin knife, loosen sides of pies from pan; remove from pan and place top sides up on cooling rack. Cool 10 minutes longer, and serve with 1 generous tablespoonful whipped topping. 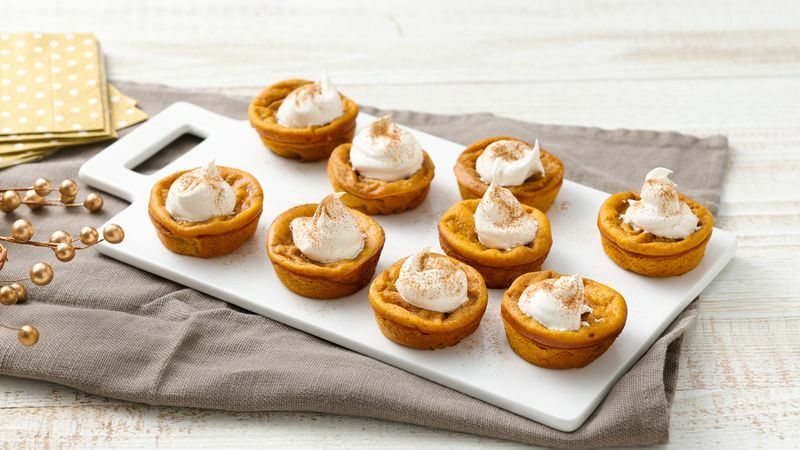 This mini pumpkin pie recipe seems too good to be true. It’s easy, delicious and will definitely be the cutest plate at your Thanksgiving table. Just prep for 10 minutes and pop these minis in the oven—easy as pie! With tons of pumpkin pie recipes to choose from, we suggest using this version as a fun on-the-go treat or as a yummy holiday sweet that’ll still leave room for your other favorite desserts—no need to resist all the apple and pecan pies sitting on the table. And when a mini pie just won’t cut it, Betty’s got all the tips you need to pull off the perfect pumpkin pie.